MANOWAR - FIGHTING THE WORLD RE-ISSUE (LP) | Online Shop | Wizard LTD. 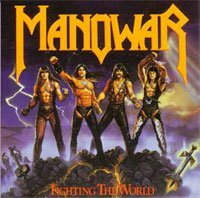 Album: "FIGHTING THE WORLD RE-ISSUE (LP)"
Fighting the World is an album released by Manowar on 1987. This was the first Manowar album to feature artwork by long-time collaborator Ken Kelly, and also the first heavy metal album to be recorded and mixed entirely on digital equipment.